2CV – no option but to sell? – HubNut – celebrating the average! 2CV – no option but to sell? When my wife and I moved to Wales in 2010, we know life would be tough. Between us, our household income dropped to about a third of what it had been. I am the only one earning money, and I do it in the highly unstable environment of freelance writing. As security goes, it’s a bit like putting your most prized possessions on the end of a broom handle, balanced upon the chin of fate. While fate is on roller skates. On a hill. Being pelted with bricks. But, we get by. Food grows in the garden, we rarely travel outside the local area and holidays are a thing of the past (apart from the one coming up but we’ll ignore that for the sake of dramatic narrative). I try to enjoy my car habit, but do so with the knowledge that big expenditure is just out of the question. I won’t be owning a Rover SD1 just yet, nor a Triumph Stag. V8s are generally not driven by skint hippy types. Can I really sell my 2CV? Cars have a habit of being expensive things to run though. It is possible to do it cheaply – witness the fabulous Sirion – but the problem is that I own cars which are not cheap to own. The 2CV these days falls into that category. I bought Elly back in 2000 for £450. Glory days. She was the latest in a long line of cheap 2CVs. I ran them until they were too broken to run, or too rusty to pass an MOT. Then I got a new one. Naturally, I realised this couldn’t go on forever, so Elly was fortunate and got restored. Problem is, she’s rusty again now and further restorative work is needed. This is not cheap. That would have been fine when we were both earning good money. Not having children gives you so much freedom! We had plenty of disposable income, which is why I could do things like commute in a 1955 Austin Westminster, drive the 2CV to Switzerland or drive a Citroen H van to Sweden. I would have scowled at the cost of a restoration – largely because I’d be thinking of all the other cars I could buy with the money – but I would have happily paid for it. That just isn’t an option these days. I’m worried enough about the insurance renewal (less than £300 for three vehicles, pretty impressive) and also my own tax return. Car insurance is essential, and HMRC would no doubt view my tax payment as fairly high up the to do list as well. Restoring a car is very hard to justify. I could do the work myself couldn’t I? Well, even if I had the skills, I reckon the parts and materials bill alone would be getting on for £1000 before the angle grinder (which I do at least already own) began work. Then there are all the mechanical issues I’ve been trying to ignore for the past year. Poor Elly is really getting a bit tired. I could defer decision making, declare her SORN and stash her away in the garage, but I’m very reluctant to do this. Once a car is off the road, it can be very, very hard for it to find its way back onto it again. Weeks turn into months and into years and storage isn’t kind to cars. The longer she’s laid up, the more difficult recommissioning becomes. Also, aside from the couple of months of road tax I’d get back, it isn’t something that will put money in my hand. No, it sadly seems to make more sense to offer the ol’ girl up for sale as a going concern. She currently has tax and test, making it far easier to find her a home I suspect. Cheap, roadworthy 2CVs are not exactly common these days. It wouldn’t be an easy sale though. No other car has transported me over 100,000 miles. No other car has followed me through at least nine jobs and three house moves. No other car has been with me longer than my wife. No other car was a big part of our wedding. (well, ok, my mate’s 2CV Beachcomber was but I don’t own that one!). She somehow feels like a lot more than just a car. Another terrifying prospect is the idea of not owning a 2CV. 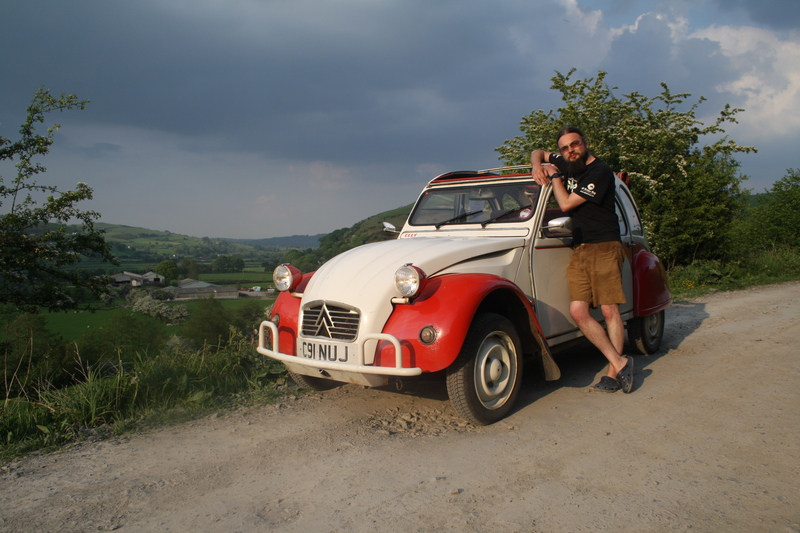 I’ve owned at least one 2CV since 1996, when I was just 18. Since then, there has barely been a time when I haven’t driven one at least once a week. I’ve been a member of the Deux Chevaux Club of Great Britain since 1996 too. 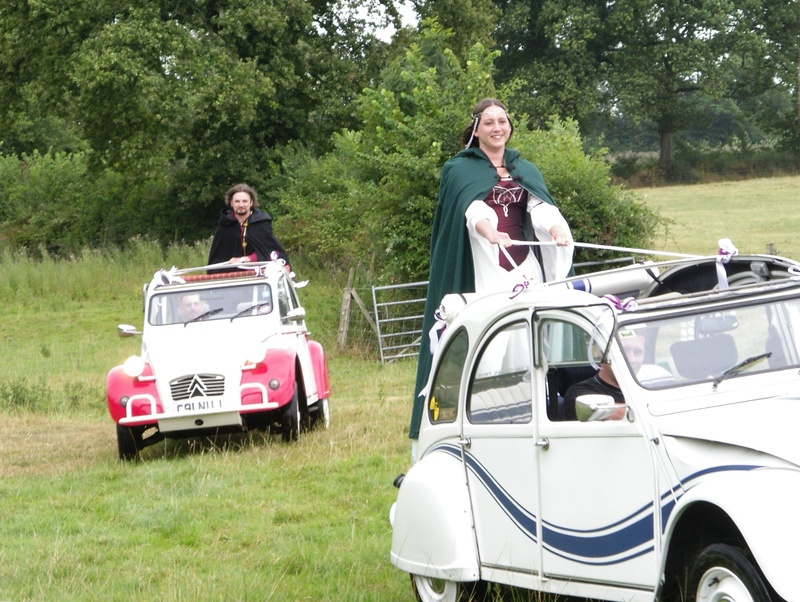 How would it feel to be a member but to not own a 2CV? Rubbish I suspect. For all these reasons and more, selling the 2CV is a very unappealing option. Truth is though, it might be the only option to take. Maybe find a sympathetic party who would at least keep her in her current shape and give you first rights to buy it back? I think the kindly words of 2CVers will help me see the right way to proceed. But I fear it might be bye bye Land Rover. Something HAS to go!